In 1992 Martin Bodewell and Lars Felker met in a Club called “Index” and discovered that they had the same interests in music. Martin and Lars each had their own musical endeavors at the time, but after only one meeting, Orange Sector was born. The legendary band DAF was a big influence on the dominant sound of Orange Sector. The name was a result of the band simply playing with various words. The Orange Sector was the name of the environment on stage. This is the place where everyone would meet, forget their problems, and have fun. The band rented a studio to produce their demo-tape “The War Comes Home.” In the early years this name and lyrics represented the problems with society. The album art showed an American farmer who buried Agent Orange barrels in the ground. Lars and Martin only sent the demo to one record label, the legendary 90’s EBM juggernaut Zoth Ommog. Label mastermind Talla 2XLC gave it to the producer Andre Schmechta (of “X Marks The Pedwalk”) and said “I like, make it!” The dream came true! 1993 saw huge milestones for the band: the first record “Faith” was recorded at the T.G.I.F. Studios, The song “Kalt wie Stahl” was a huge hit on the club dance floors. Orange Sector embarked on its first major tour with the Swedish band S.P.O.C.K.. The band became known for putting on a great live show. Orange Sector’s “body show” was full of energy, gaining many fans, and lead to the founding of the Orange Sector Fan-Base “Bodysmashing”. During the Faith-Tour the band worked on new material for their next release. In 1994 the band released the album Flashback, which is considered their greatest album to date, and still hailed as a classic in the EBM genre. Both personal and professional reasons caused Lars to leave the band, though he and Martin still remained in contact. Martin decided to carry on with the project, and after a long break released the record Love it. The new songs were much softer and more melodic. The old fans did not accept the new sound. In 1998 Martin rejoined Zoth Ommog with two more releases, Scars of Love and Masquerade. After a while, Martin lost his motivation and decided to leave the music scene. In 2004 EBM was reanimated. The classic EBM sound was taking back the club scene once again. Torben Schmidt, label owner of “Infacted-Recordings,” and the mastermind behind “Lights of Euphoria” played the old Orange Sector songs during his work as a DJ. He decided to contact Lars with a plan to release a compilation through the history of Orange Sector. Lars convinced Martin to have the album released. Martin said yes, and the band in the original line-up was together again. The Compilation Here We Are [BackAgain] was released in March 2005. A reinvigorated Orange Sector followed the release with an all new album in 2006, their first in over 12 years. Bassprodukt took Lars and Martin back to their roots: Hard, driving old school EBM. 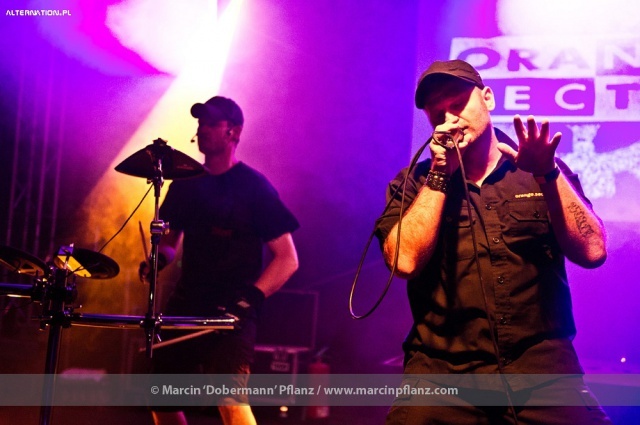 In 2010, the electro legends join Metropolis Records to release their 8th album, Krieg & Frieden.The album represents a return to their roots with its aggressive synths, kinetic hooks, and unrelenting bass-lines. True to form, Orange Sector has once again raised the bar for others to reach. This is what true EBM is all about. In 2015 Orange Sector, two man EBM pioniers from Hannover/Germany, return with "Night Terrors". Ten massive new ebm songs plus three great mixes are the result of this new production! The opening track "Braindead" marches through your brain reminding one of the good old Nitzer Ebb style. "Monoton" is a typical Orange Sector smash followed by the main single song "Glasmensch". "Burn in Hell", german "Rebell" and "Protest" are pure dance floor hits before songs such as "Das erfrorene Herz", "Wir sind Mensch" and "Z.o.m.b.i.e." slow down the speed a bit. "Das letzte Lied" (the last song) and the mixes of "Burn in Hell", "Rebell" as well as the massive "Sturm (Martin Bodewell Remix)" speed up things to the end of this ebm smash album! Since the beginning of the so called 80's the term "Electronic Body Music" has established itself as a part of the global electronic music movement. Pulsating basses and machine like rhythms have become the trademark of a whole music scene. Bands like Nitzer Ebb, Front 242 or Pouppee Fabrikk are named to be the pioneers of this movement. 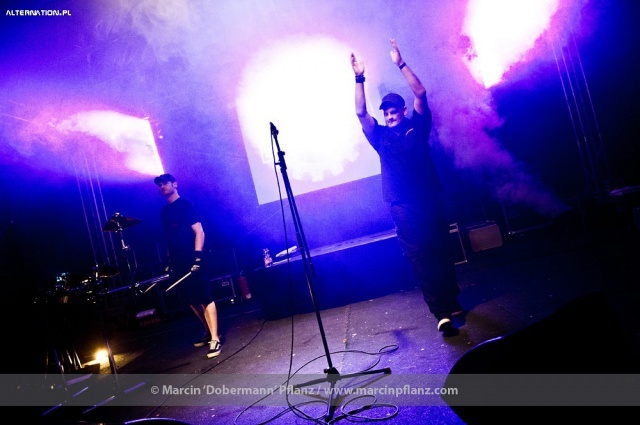 Orange Sector are part of the so called "second wave" of the EBM scene with a history of 23 years, 12 album releases, several EP's and singles. The new "Monoton" EP is the first part of a planned trilogy featuring 4 songs and 3 remixes done by NZ, Agrezzior and Celluloid. This new 7 track CD is by far the most strong release by Martin Bodewell and Lars Felker to date. In 2016 After the successful release of their "Monoton E.P." Orange Sector return with the second part of their trilogy. Another real EBM smash. Hard hitting electronic beats with the outstanding shout vocals by singer Martin Bodewell. "Stahlwerk E.P." is a true must have for all EBM addicts. "Im Stahlwerk", "Terroristen", "Der Clown und das kleine Mädchen" or "Tanz in den Frieden" are true Orange Sector hymns. The 8 song EP features outstanding remix versions by Martin Bodewell and Nordarr as well as the pulsating Clubstahl Mix of "Im Stahlwerk" and the uptempo version of "Der Clown und das kleine Mädchen". Then at last comes the third part of the Orange Sector E.P. trilogy. After "Monoton" and "Stahlwerk" the limited EP will be entitled "Farben". Main song will be the title song "Farben", a massive pumping club tune made to make you dance! Second main tune is "Götter" an "old" ebm stomper remade for the live shows and stronger then ever. "Ich sehe dich sterben" a tribute to all people who recently lost their lives. The band wanted to do a very personal and moving "goodbye and thank you" and wrote this song. As bonus the EP features great remixes by AD.keY, Zoon Politicon and Blitzmaschine.